one sees the true spirit of Christmas. This time I wanted to share something classical. with a knowing glint in his eye. This is a card that I made for a special friend about to enjoy his first christmas with his first grandchild. and the writing one is from Kaszazz. The inks are distress and the black ink is archival. ~ Christmas Cards All Year ‘Round – Must use a Santa! I love this stamp too Dot and you have created the perfect card with it. I bet your friend loves it too. It is a lovely image Dot and the colours you have used are totally in keeping with the Victorian feel. Such a wonderful image, you've created a fantastic card. Gorgeous card and a beautiful image Dot which looks so lovely left in monochrome against the inky textured backgrounds. What gorgeous colors in your background! I love how you kept the main image simple and let it contrast and pop against the rich background colors! 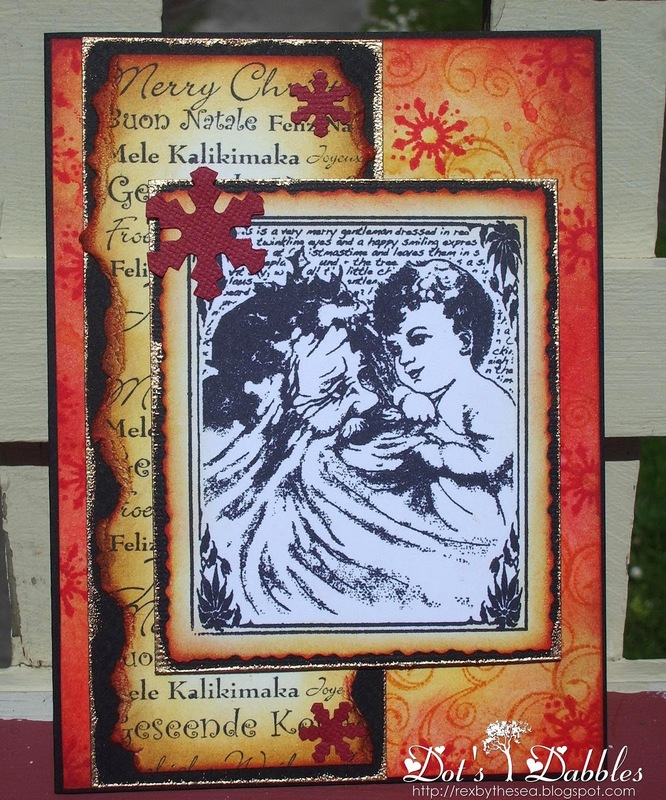 Beautiful job!Thank you so much for playing along with us this week at Loves Rubberstamps! That image melts your heart. You have created a most magical Christmas card here. I love the vibrant traditional colors and the blending of black and white vintage. Perfect design! Fabulous image and design, I love that it's for someone with their grandchild! Thanks for playing with us over at Loves Rubberstamps!!! I love the image you used very much. Wonderful card, the image is pure nostalgia, loving the colours as well. Sweet image, beautifull colours another beauty to send into the world!! What at really gorgeous card, Love the beautiful image that you used! Thanks for joining us at Loves Rubberstamps! Beautiful card Dot. I love the deep, rich colours and the image is gorgeous. I love all your distressing. This is a wonderful card. Thanks for sharing at LRS! Dot your work still amazes me everything always looks so perfect and this is no exception.